Where do I use my Q-Park voucher code? Select your Q-Park deal from us and copy the code that appears. Follow the link through to the Q-Park website. Select your option and fill in your details. Then paste your code into the ‘Promotional Code’ box and click 'Apply code'. If you don’t have a promotional code, you can enjoy an automatically discounted deal. With over 15 million customers across the UK, high-quality car parks that are clean, bright, safe and secure, superb customer service and affordable prices, Q-Park are a parking company you can trust and rely on. Q-Park ensures that parking with them is fast, comfortable and convenient by providing spacious parking bays, clear directional signage, well-lit walkways and stairways, and state-of-the-art payment systems. With over 800,000 parking spaces in Europe, Q-Park is one of the top providers on the market. Find parking spaces in multiple cities across the UK including London, Birmingham, Manchester, Sheffield, Glasgow and Leeds. Click the ‘Find a car park’ link to find your nearest Q-Park car park and book your space in advance online, for up to 50% off. All Q-Park car parks are securely fitted with CCTV cameras and regular patrol units and hosts, you don’t have to worry about the security of your car as it waits, or your personal security coming to and from your car. And with vehicle entrance speed gates you can be sure that the only people driving in are placeholders. Q-Park is committed to providing access and availability for a variety of different needs, and they work hard to guarantee that all car parks are disability accessible and have reserved bays for Blue Badge Holders, with lifts and automatic doors fitted in almost all of the parking facilities on offer. As well as standard car parking, Q-Park also offers a long-term or short-term car storage facility to make sure that your vehicle is safe and out of the way while you head off on holiday or a trip. Q-Park also offers car parking at selected hotels across the UK, which enables you to pre-book spaces at hotel’s you’re going to be staying at, so you don’t have to waste time looking for space once you arrive. As well as all this Q-Park also offer theatre parking, perfect if you’re heading out to a show. When you book online with Q-Park you can receive 50% off your theatre parking too. Q-Park season tickets offer excellent value for money and are a very convenient option for those of you who frequently park in the same car park. 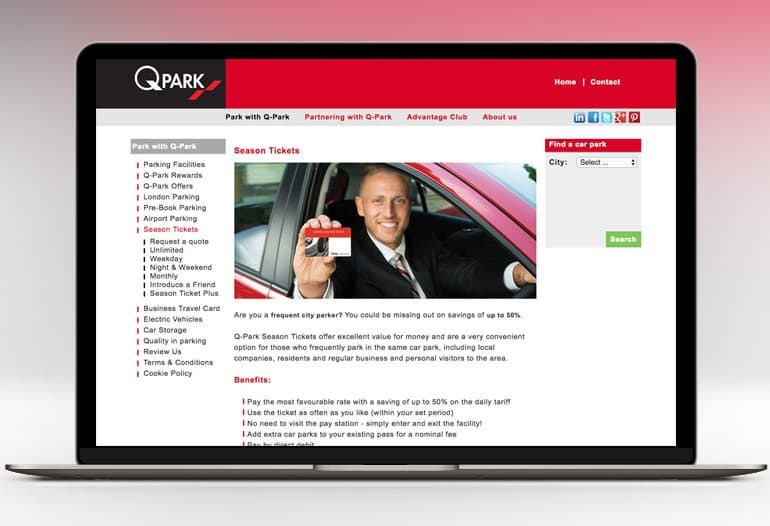 If you’re a local company, resident or regular visitor to an area where there’s a Q-Park car park, save yourself some time and hassle and get a season ticket with Q-Park, so you know you’ve always got somewhere secure to leave your car. Pay the most favourable rate with a saving of up to 50% on the daily tariff, use the ticket as often as you like (within your set period) without having to pay each time you park, add extra car parks to your existing pass for a nominal fee, pay easily by direct debit and gain exclusive membership to the Q-Park Advantage Club where you’ll receive loads of offers and discounts. Choose an unlimited season ticket for entry and exit without any restrictions 7 days a week, 24 hours a day at your regular car park, choose weekday tickets for access to your regular Q-Park car park 5 days a week, choose weeknight and weekend tickets, perfect if you’re staying over or need somewhere to park on a night out or weekend away, choose a business travel card ticket if you need flexible parking for work, or a season plus ticket. Available at 60 car parks, Q-Park’s new product, the Season Ticket Plus, provides you with the opportunity to add another location to your existing Season Ticket. There are many other promotional benefits that come with season tickets too. If you are an existing Q-Park season ticket holder and you introduce a friend, Q-Park will reward you both with a £25 M&S Gift Voucher when they purchase a Q-Park Season Ticket! You also have the option to save money on your season tickets when you buy with a Q-Park voucher code from us. What happens if my car breaks down in one of your car parks? Many of the Q-Park car parks are equipped with a Jump starter and the parking hosts, who have been trained on this equipment, will be happy to assist you. Can I enter and exit the car park more than once if I pre-book? No, when you pre-book your parking you can only enter and exit the car park at the times stated with your booking. Your car must remain in the car park for the duration of the booking, you will not be able to exit and re-enter multiple times. Write: Q-Park Limited, 72 Merrion Street, Leeds, West Yorkshire LS2 8LW. Q-Park is an independent international parking company who provide safe and secure parking spaces in a total of 74 locations across 22 cities in the UK, and Europe, including London, Leeds, Liverpool and Glasgow. 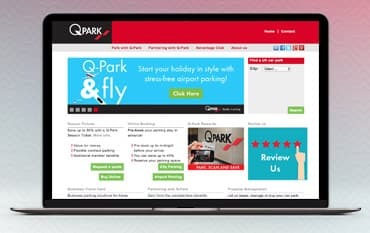 With consistent and convenient parking you can trust Q-Park with your vehicle, and save up to 50% off when you book your parking stay online. Use one of our Q Park voucher codes alongside your booking, and you could save even more on your parking space. Whether you’re leaving your car overnight, for a few days or just for a couple of hours, you can find the perfect parking location with Q-Park, simply find a park in your chosen city and book your space online. 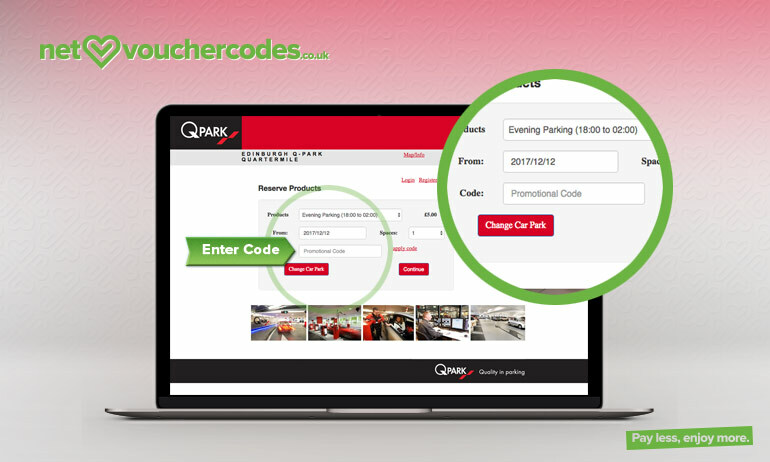 We are constantly on the hunt for Voucher Codes for Q-Park to help you with your money saving. Our experts check dozens of sites for secret codes including NHS discounts, student sites & social media channels saving you time & money!